Coming from Shout! Factory on April 12th, 2011 is an Action-Packed Double Feature of Dirty Mary, Crazy Larry and Race with the Devil. Both films were originally released by Anchor Bay back in 2005 and have since gone out of print. It is great to see them re-released again, especially by Shout! who handles every release with the highest of standards. Not to mention the fact that Anchor Bay's Race with the Devil had possibly the ugliest and cheapest DVD cover I've ever seen (see the travesty HERE). 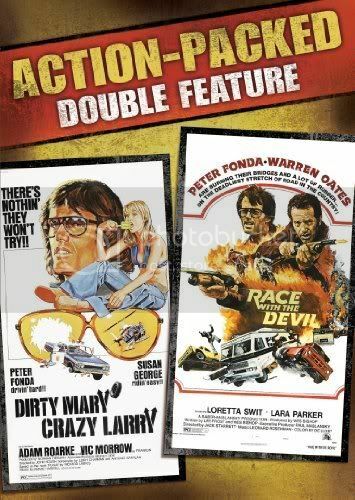 Anyway, with two films starring Peter Fonda, not to mention Dirty Mary featuring the beautiful and always fun to watch Susan George and Race with the Devil starring the great Warren Oates, this set is a must! 1974's Dirty Mary, Crazy Larry follows an ex-Nascar racer (Fonda) who, along with his mechanic Deke (Adam Roarke), rob a grocery store owner by holding his family for ransom. After getting the money, they take off to re-join the racing circuit. Mary (George), a foul-mouthed groupie with nothing going on in her life, manages to trick them into letting her tag along. Soon, the cops are hot on their trail but Larry's driving skills make them hard to catch. Enter Police Captain Franklin (Vic Morrow), who takes the matter into his own hands after several failed chases and road block attempts. 1975's Race with the Devil stars Warren Oates as Frank, the owner of a motorcycle shop and Peter Fonda as his friend Roger, a racer. They decide to go on vacation together (along with Roger's girlfriend and Frank's wife) in Frank's new RV. The first night of their trip, instead of staying in an RV park, they decide to find a nice secluded spot in the middle of nowhere for some peace and quiet. Roger and Frank go to explore some strange noises they hear not too far from their spot and end up witnessing a satanic ritual which ends in a human sacrifice. They are spotted by the devil worshippers and barely make it out alive. After alerting the local police, they continue their vacation but soon find themselves being hunted by the cult. This Action-Packed double feature is a great slice of 70's drive-in heaven. Other than Peter Fonda, the only real similarities between the films are several exciting car chases. Dirty Mary, Crazy Larry is basically one long car chase, with a few bumps along the way. Fonda and George are great as a pair of feuding ex-lovers and the car stunts are out of this world. Vic Morrow is another highlight of the film, especially his helicopter chase scene at the end. The sharply written (and very dated, but in a good way) dialogue makes the characters stand out and saves the film from being just a series of car explosions. Race with the Devil is part of one of my favorite horror sub-genres - occult horror. Though definitely not just a horror film, Race features several death defying car (or RV) chases too. Basically an occult horror, car chase mystery with very few gaps in action. The cast is top notch all around and the story is filled with several twists and turns, making the viewer unsure of every character that pops up. Of the two, I would say Race with the Devil is the stronger film but they are both very entertaining and worthy of a re-release. This 2 disc set includes a ton of special features (commentaries, interviews, trailers, TV spots and radio spots) and beautiful Anamorphic Widescreen Transfers. Another excellent release from Shout! Factory.